An earlier prototype made with Granny Smiths and closer to the original had slightly reduced sugar. Friends rapidly scraped every crumb off the plate so it was clearly yummy and addictive. But it felt a bit sweet. Here it is decorated with a little caramel sauce and pie crumb formed into misshapen logs under caramel flames because it was November 5th bonfire night. The final slightly healthier prototype is my favourite. I daydream about getting home to eat a slice or two, cycling back faster to help burn off previously consumed cake. At school a colleague’s eyes glazed over with cake joy as she yummed her way through a slice during our break. 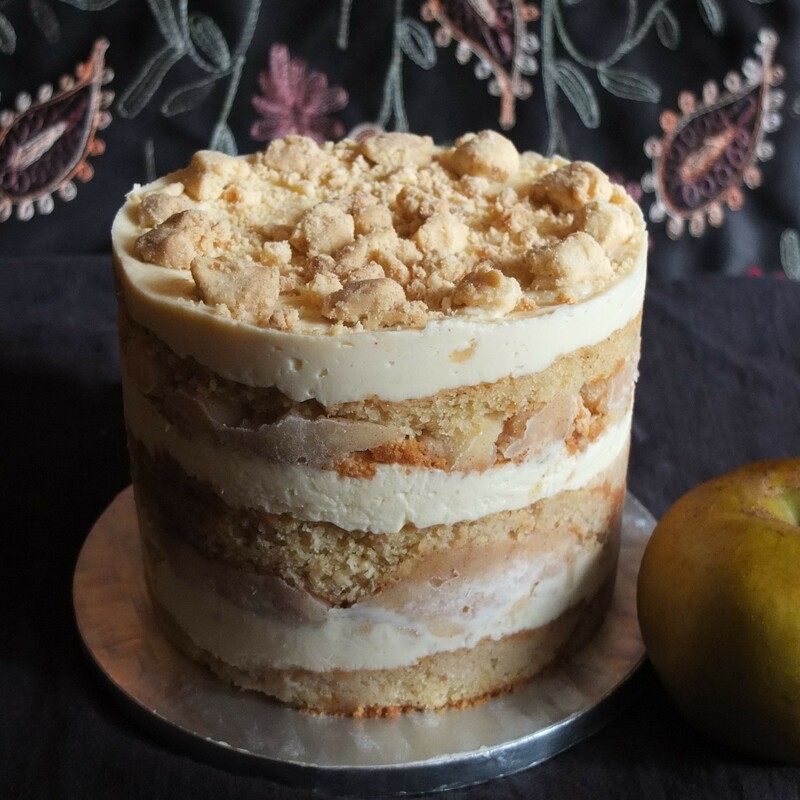 This cake is a slightly simplified version of Christina Tosi’s cake in the lovely Milk Bar book. I eliminated her top creamy layer by replacing it with extra liquid cheesecake, meaning reduced work and sweetness. The official recipe in grams is at the Guardian online here or there’s Gastronomia & Cia’s Spanish version here. 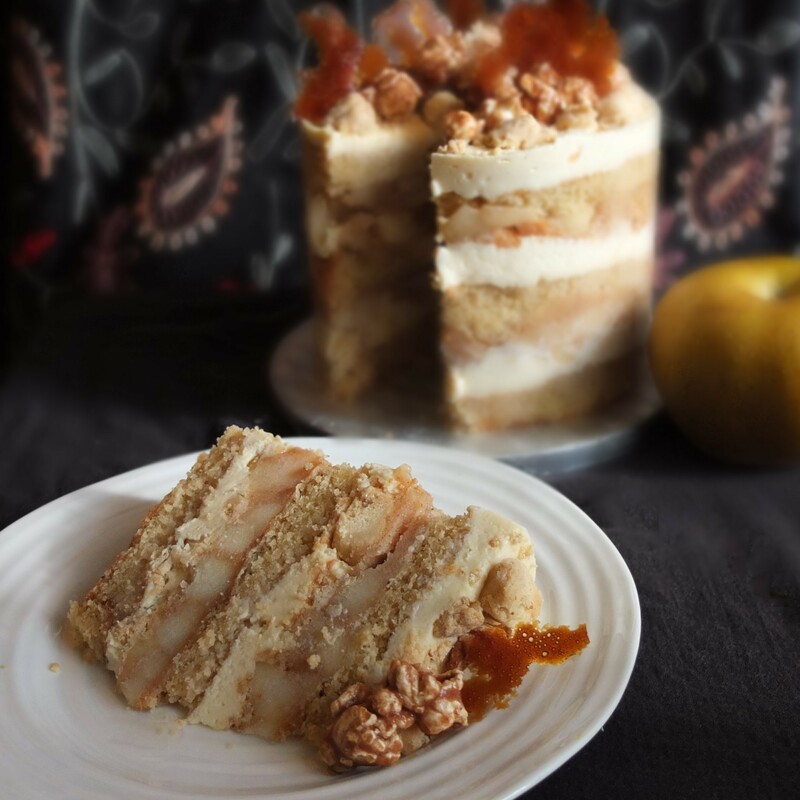 Google Tosi apple pie layer cake for other versions. 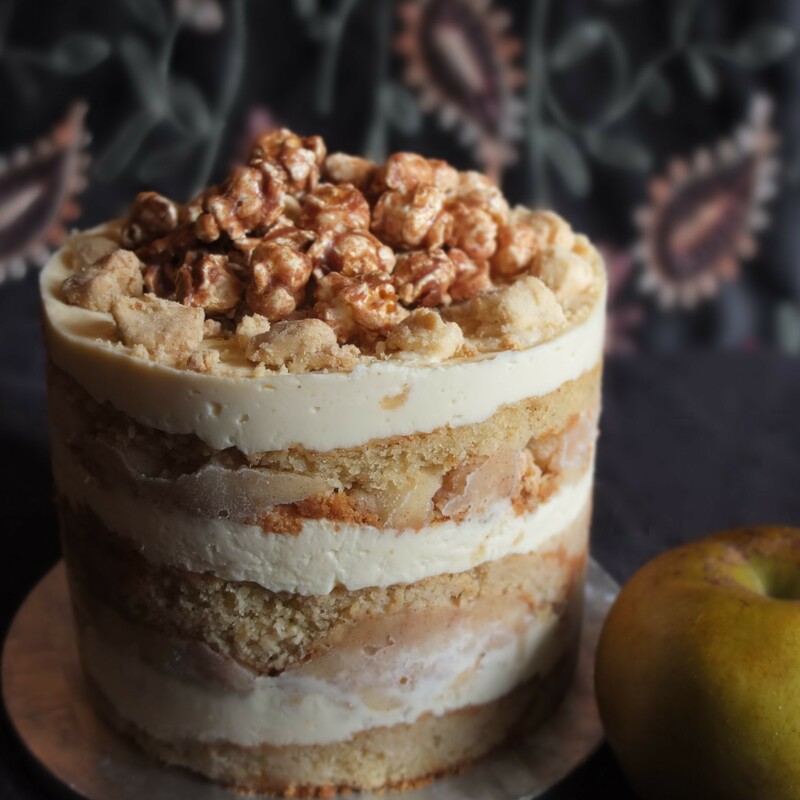 And you can find out more about Christina Tosi in Netflix’s Chef’s Table series 4, pastry. 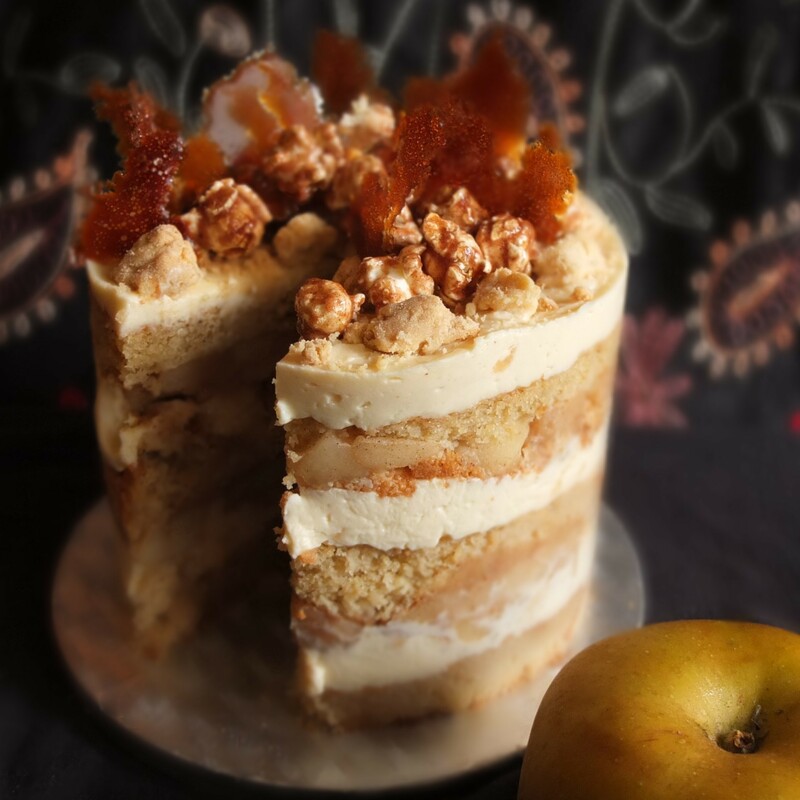 Apart from using Doves Farm self-raising gluten free flour and less butter, sugar or cream cheese but more apple, I also added optional Calvados apple liqueur to the apple soak – nice! The quantities were decreased to reduce or eliminate leftovers. 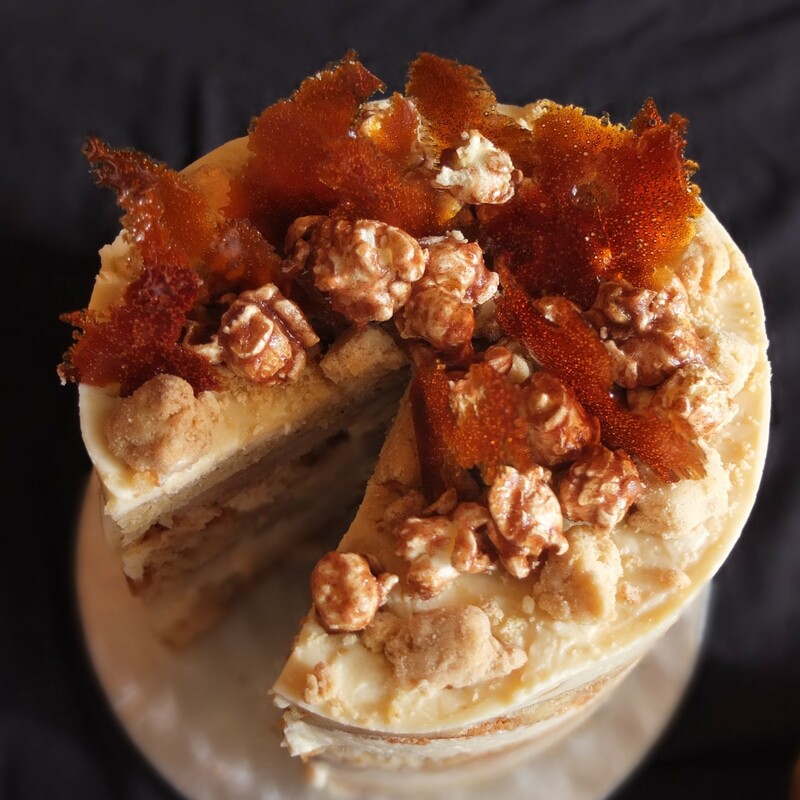 The caramel shards and popcorn were added for decorative purposes, flavour and crunch. For prototype 1 a little caramel sauce on top was a yummy addition. Feel free to experiment. Or keep it simple and healthier with no shards or popcorn. Still very attractive and yummy. SPREAD OUT METHOD. DURING THE WEEK – Make various layer elements over several days before assembly stage. Store pie crumbs in an airtight mason jar. In the fridge store sponge in plastic film plus cheesecake and apple pie filling in separate airtight containers. 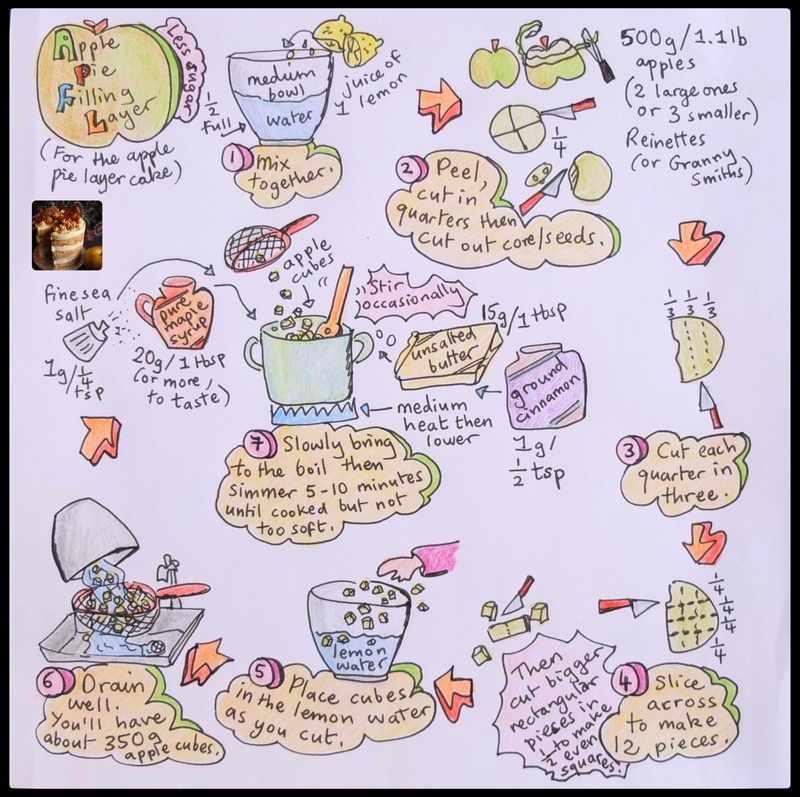 DAY ONE – make apple soak + assemble then freeze overnight. DAY TWO – as above. Baking tin: 32cm x 23cm (13in x 9in) and 4.5 to 5cm high (2in) or similar to this rectangular tin. Cake ring: 14cm/5.5in diametre and 6cm/2.4in high (I used 4.5cm/1.7in high, which works okay). Acetate strip (6cm/2.4in wide) like this one or this one and sellotape. Butter should be unsalted and good quality French-style like Président. I use golden unrefined caster sugar and Doves Farm self-raising gluten-free flour. Pre-heat oven to 170ºC/340ºF (fan/convection) or 190ºC/375ºF (static oven). Melt butter in a small heavy-based saucepan on low heat. 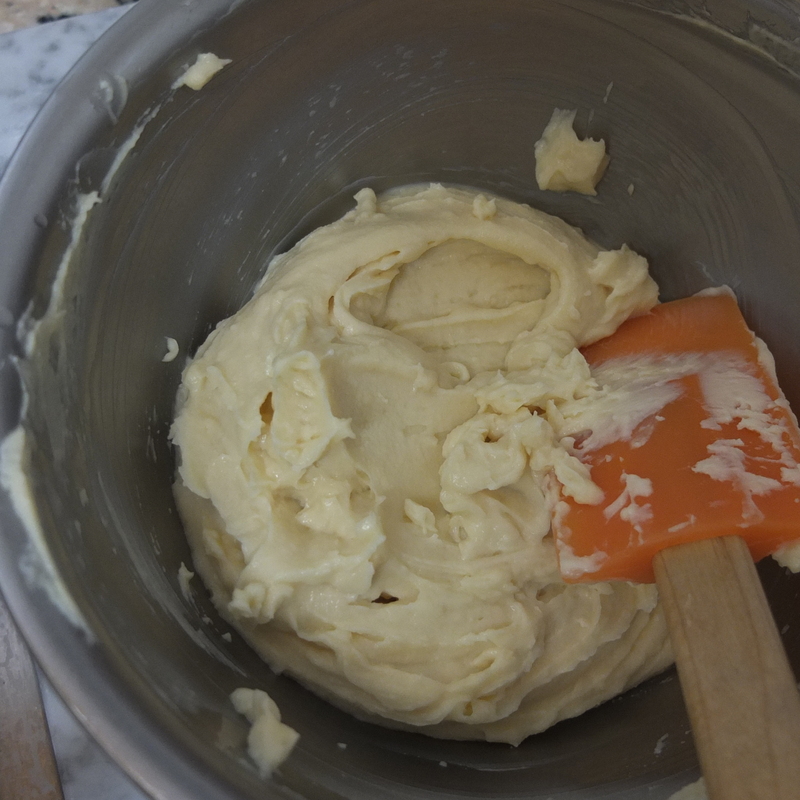 Whisk flour and salt in a medium-sized bowl to combine. Add melted butter and maple syrup then 2 teaspoons (about 11g) water. Stir mixture until it starts coming together. Add a little extra water gradually until you get a slightly moist ball that stays together and gathers up all the little crumbs. Lay out small clusters on a baking tray lined with baking paper. After 5 minutes in the oven lower temperature to 160ºC/320ºF (fan/convection) or 180ºC/350ºF (static oven). Bake another 20 – 30 minutes until golden brown and starting to harden. I like them crunchy. Pre-heat oven and use baking paper to line baking tray (see size in Equipment section above). If using gluten-free flour the sponge may not spring back under your finger but a skewer inserted in the middle of the baked cake should come out clean. If not, bake a further 5-10 minutes. Cool in tray 5-10 minutes then carefully turn out onto a wire rack to cool completely. This sponge can be stored in the fridge wrapped in plastic film up to 5 days or in the freezer 1-2 months. Before starting bring the cream cheese, skyr and egg to room temperature. Use baking paper to line 20cm/8in diametre cake tin. 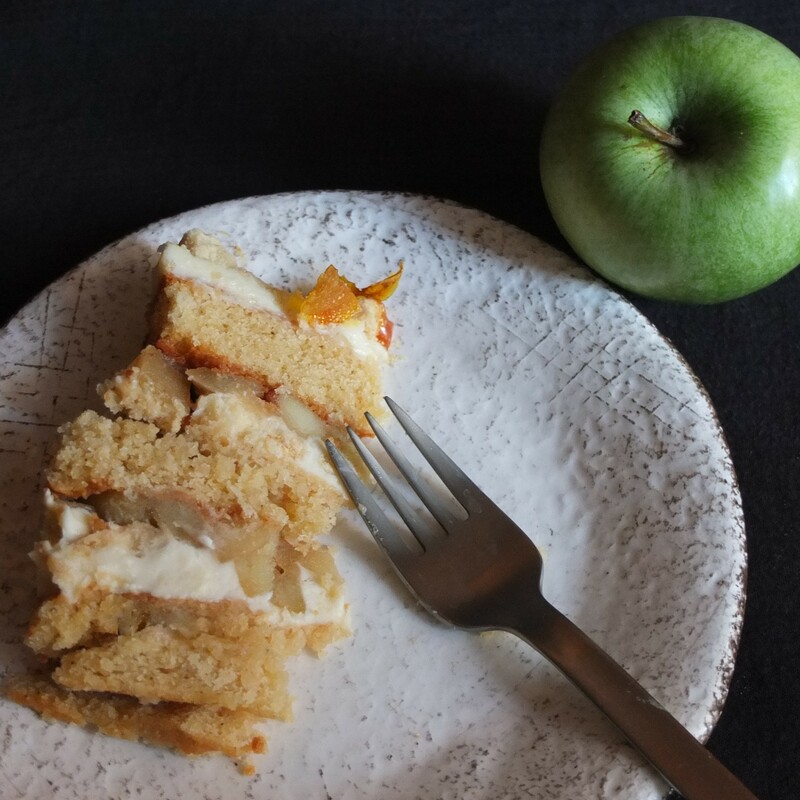 If you prefer your cakes less creamy you can try reducing the quantities by 2/3: 153g cream cheese, 67g skyr, 67g caster sugar, 20g/1tbsp maple syrup, 54g beaten egg (1 small/medium-sized egg), 6g/2 tsp cornflour, 1/2 tsp (2g) fine sea salt. You can see in the first photo below that the baked cheesecake hasn’t browned. Perfect. Store at room temperature if using the same day or in the fridge. Apple juice or cider soak – optionally spiked with Calvados apple liqueur! Whisk together in a small bowl to combine. Check flavour and sweetness is to your taste. When everything’s cooled to room temperature start assembling. 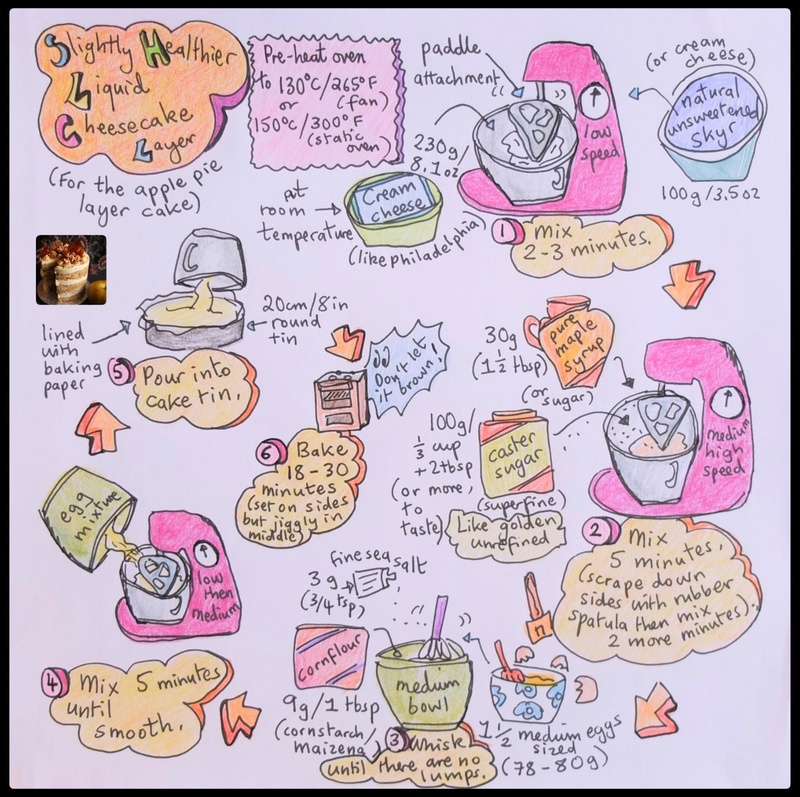 Cut sponge then line the cleaned cake ring with acetate as in the illustrations. 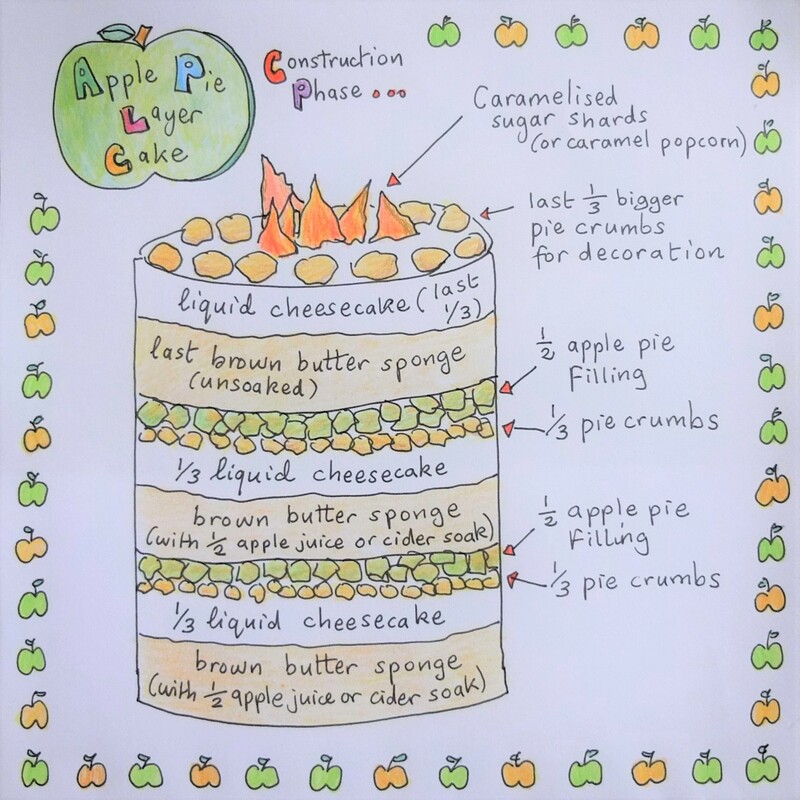 Brush the bottom 2 sponge halves with 1/2 the apple soak and continue constructing as per the following illustration, pressing pie crumbs in the middle layers lightly into the liquid cheesecake with the back of your hand. 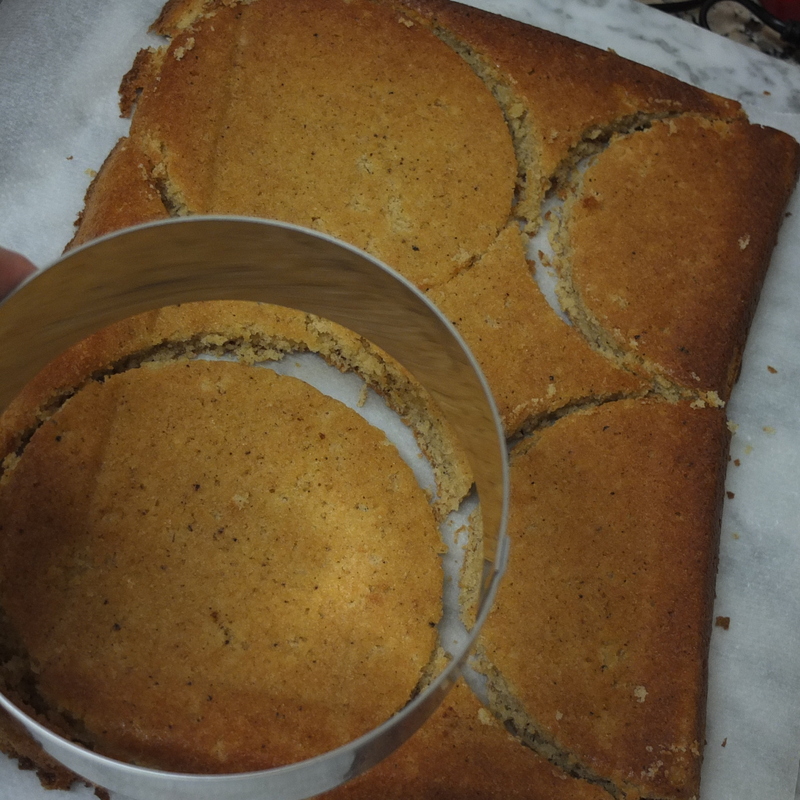 If sponge layers break or crumble a little fill the gaps with small extra pieces of sponge. It won’t be noticeable later. Save the best complete layer for the top. Freeze leftover sponge to make apple pie cake truffles. Freeze overnight (12 hours) in the acetate and cake ring. Slide a large sharp knife under the frozen cake, between the bottom of the cake and the base or plate. Lift cake carefully with one hand and slide the cake ring downwards off the cake and onto your arm. Place the cake back on the base/plate. Whip off the acetate (cut if necessary) and defrost in fridge 3 to 4 hours before eating. Yay! 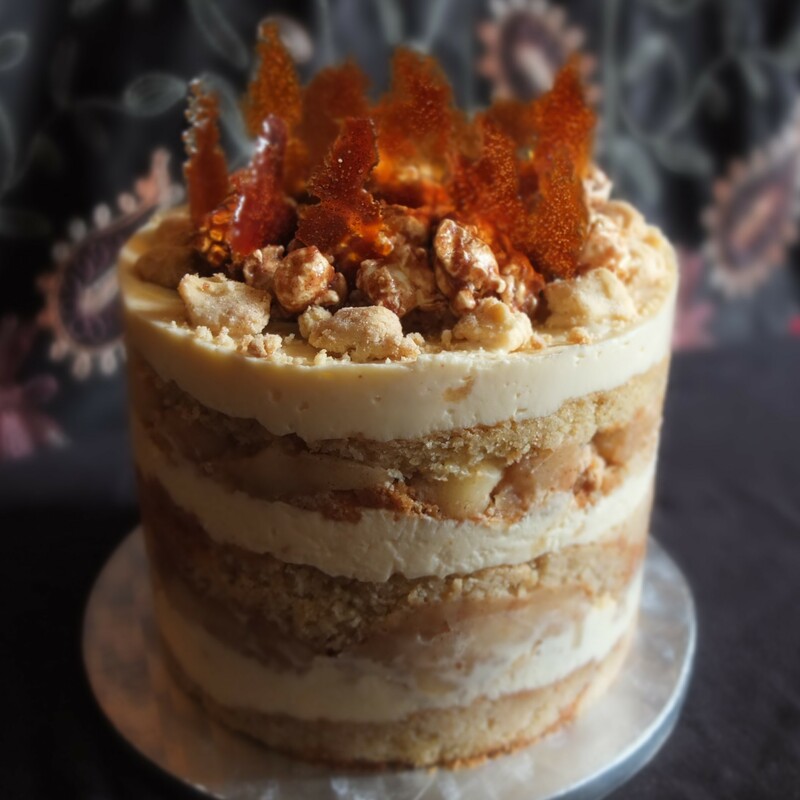 Here’s the cake with just cinnamon caramel popcorn. 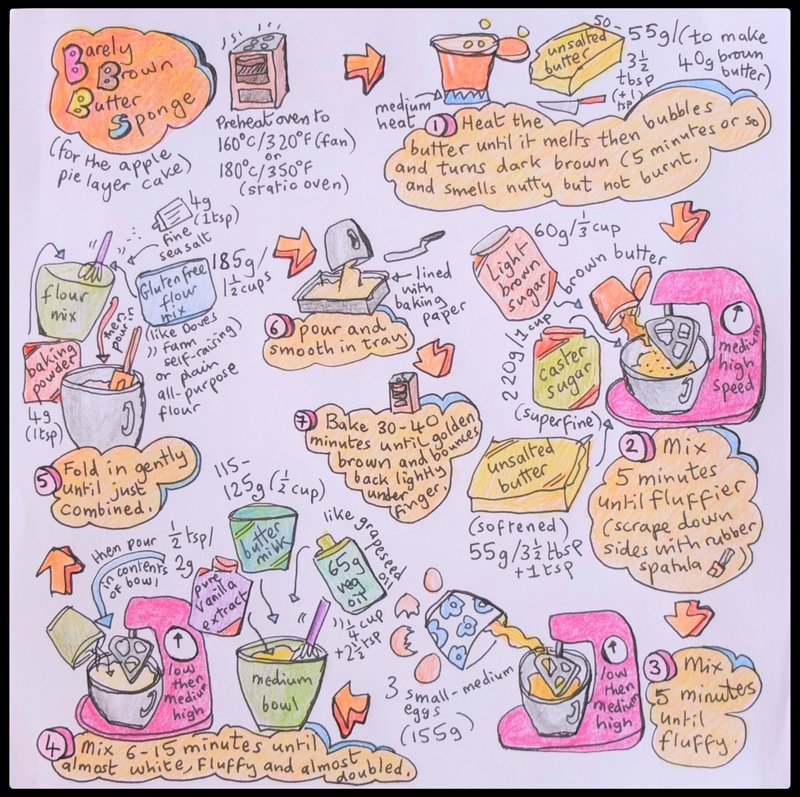 Add popcorn last minute – it gets soggy in the fridge! Caramel sauce also makes a nice addition, or shards. These are so easy to make. Sieve a thin layer of caster sugar over a baking tray lined with baking paper. Bake 15-20 minutes in the oven preheated to 170ºC/340ºF (fan/convection) or 190ºC/375ºF (static oven) until most of the sugar melts and caramelises. Take out and wait 5 minutes or so for the caramel to harden (careful, it’s hot). Then peel the paper off the back of the shards. The shards here were not bitter but a bit dark – make them lighter if you prefer. Keeps in the fridge up to 3 or 4 days, maybe more. You can immediately cut slices from the still frozen cake to freeze in airtight tupperware up to 1 month or two. Defrost 3 hours in the fridge before eating. Here’s a slice of the earlier sweeter version. It looks wonderful and so delicious! It does look wonderful and delicious, Lili. 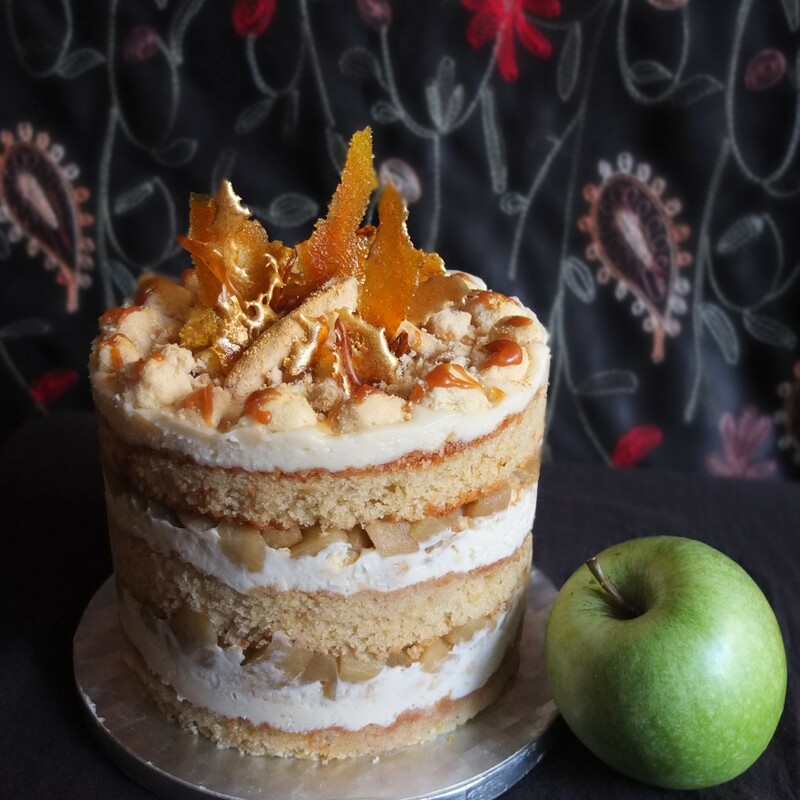 I haven’t had Calvados in at least forty years (yes, since I was a baby 🙂 ) It would be worthwhile trying this cake just for that. Thank you Mary, also for that great image of you sipping Calvados as a baby. 🙂 Have been thinking I might double the quantity of calvados next time and include it in the apple filling too. I’ve had a thought, Lili. What about Calvados in Tiramisu?